welcome to my Web Site,in Eastern Okla.
We strive to raise the best quality and the happiest pups we can..
All pups are socialized daily.. They will be wormed at least 4 times. They will have had 1-2 shots.. 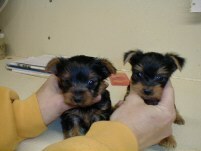 They will be Vet checked..
All puppies will be groomed according to their breed.